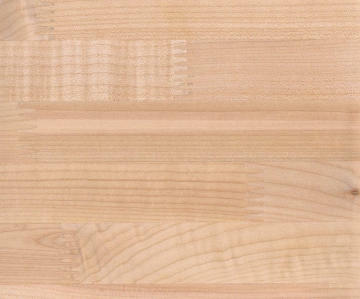 Maple butcher block is our standard high quality product for the vast majority of counter tops, islands, and table tops. 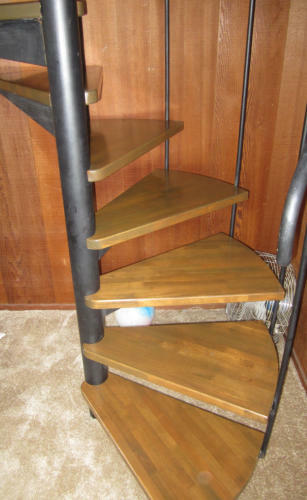 Manufactured from Pacific Coast Maple which grows in Washington State, it is made by finger-jointing 10" to 24" pieces of clear wood into strips of the desired length. 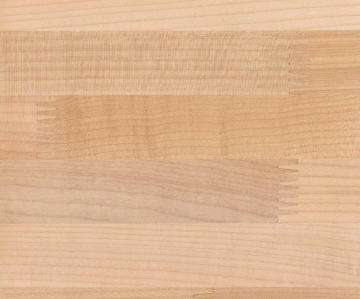 The strips (1.3" to 1.7"wide) are then glued face-to-face to form an edge-grain Butcher Block product. Perfect Plank is laminated with water resistant polyvinyl glue. One face is of furniture quality, sanded with 120 grit paper. Reverse side may contain defects and is sanded with 80 grit paper. 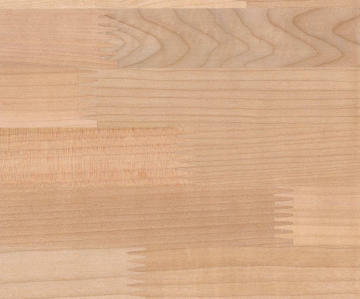 Maple butcher block is available in a wide variety of standard sizes in thicknesses of 1 3/8" and 1 7/8". Splashboard : 3/4 x 4"--$2.0 per lineal ft. 3/4 x 6"--$3.00 per lineal foot. 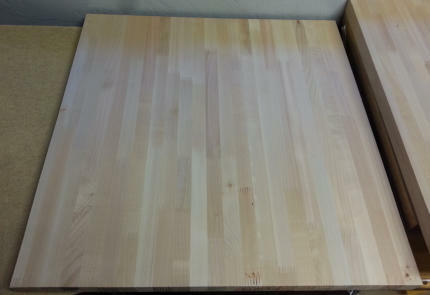 Breadboard Stock : 3/4 x 22" x 96"--$125.00 per sheet. Orders received by 4 p.m. Friday will be shipped on Friday of the following week. 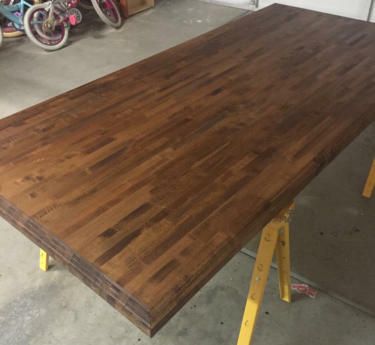 Exceptions: Plank which exceed 48" width often require two extra days. Perfect Plank Co. does not maintain accounts. Most customers send a check at the time of order or use a major credit card. Orders are shipped freight collect from Oroville, California. Orders weighing more than 70 pounds are shipped via XPO Logistics. Orders weighing less than 70 pounds (within size limits) can be shipped UPS. (Other limitations apply) Upon receipt of order, it is essential that you inspect the freight for damage prior to signing the delivery receipt! Unsatisfactory merchandise can be returned after receiving verbal approval from the Order Desk. Replacement will be made for defects which are the result of manufacturing error. However, the Perfect Plank Co. cannot accept responsibility for those defects which are inherent in the species of wood. 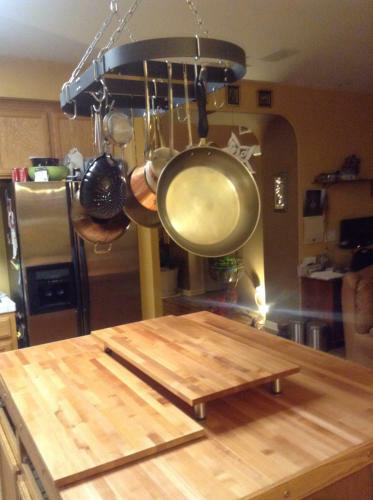 In all cases, the liability of the Perfect Plank Co. shall be limited to the sale price of the item and shall not be extended to include the value of any labor or materials used in finishing or installing the product. Upon receipt, it is essential that you finish the ends and BOTH sides of the plank immediately in order to avoid cupping or warping. All wood products are sensitive to changes in temperature and humidity, and care must be taken to prevent exposure to environmental extremes.